Nintendo's Bill Trinen Wants To Dispel The Myth That Smash Bros. Became Popular By "Accident"
Super Smash Bros. is one of Nintendo's premier franchises and has millions of fans all over the globe - many of whom play the game with incredible skill at a competitive level. However, for as long as Smash has been popular, there have been critics who attack the game's seemingly chaotic design; to the untrained eye, your typical Smash match can be hard to follow and it's perhaps tempting for those unfamiliar with the game to assume that it has no depth and is simply a case of mashing buttons. We spoke to Nintendo's Bill Trinen recently about all things Smash - the full interview, which includes input from Nintendo Treehouse localization manager Nate Bihldorff and naturally focuses on Super Smash Bros. 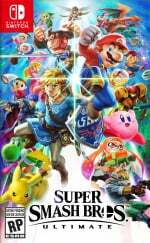 Ultimate, goes live early tomorrow - and we mentioned that there's an opinion amongst certain members of the gaming community that Smash became popular almost due to a "happy accident"; a stance which insinuates that Nintendo - and series creator Masahiro Sakurai - didn't really know what they were doing, or that the game would become the big competitive draw that it is now. Where do you stand on this topic? Let us know with a comment, and don't forget to check back for the full interview tomorrow. N64 Magazine actually run a petition for readers to demand that Smash Bros gets released in the U.K. as back then it was uncertain if Nintendo would actually do so. The n64 smash commercial is the very reason I got in Smash bros.
And no thats not a accident. That what people who are jealous of its popularity say. Just like the people who badly want Nintendo to go 3rd party. Anytime they do good it's a fluke. The first time(s) you play it, it's sure pretty easy to think it's a total mess. I did. But when you start getting the layer of depth in it, oh boy... you're in for a neverending treat. Doing something when you dunno what you're doing generally isn't a recipe for success. Nintendo strikes me as the kind of company that does very little by accident. Most of its decisions, for better or worse, seem to this casual observer like they result from very careful planning and preparation. So, was that why we had all those seemingly inconsequential Smash details in this year's E3 Direct? To show how every decision is carefully planned and dispel that myth of a "happy accident"? That helps to explain why the presentation was so lop-sided. I still don't agree that that was necessarily the way to go, but at least some of that Nintendo logic has been elucidated, for once. I got that same feeling of intent from HAL Lab's choice to make the new Smash the ultimate merger of all previous Smash. At first I was disappointed, because I just wanted them to find a fresh perspective and see what new direction that would take them. But a day later I realized that Nintendo is now supporting competitive play, what with the E3 invitational, and that the competitive scene is split between Smash Melee and Smash 4. Bringing in another very different game could potentially further split the community into three parts. However, if your starting principle for your new game would be to bring the community together, the game would look a lot like what we're getting. That's the dumbest thing I've ever heard regarding SSB, and something that doesn't even need to be defended. I just want to know more about the Peach and Daisy differences. I remember when I first played the first Smash on N64, and I thought it was brilliant and clever even back then. I'd never seen a fighting game use the mechanics of a 2D platformer, and it worked amazingly well. Sure, it seemed simplistic at first, but the best games are those that are easy to learn but full of depth, and that's what Smash is. I'm pretty Smash'd out these days and I'm not entirely sure I'll be getting Ultimate, but I have a huge amount of respect for the series...heck I want to make a game like it myself. For real, I am so tired of seeing videos and reviews about how Melee is a "beautiful accident." I have no idea why Nintendo was unsure that it would do well. Is there anyone here who wasn't immediately sold when they learned that they were making a fighting game starring various Nintendo characters? This can’t be an accident. The only thing I can see that was any form of an accident, is when dodging into the ground became the thing known as wavedashing in Melee. It was a direct consequence of the physics, and likely an oversight in the fine-tuning, that became an exploit and opened a whole new meta dimension in that game. What was also probably accidental was the floodgate of people who didn't take the game serious as a competitor who began actually playing it competitively because said exploit took the game to another level that was undeniably cool. I've never been much of an exploiter myself of games, so I bowed out and only dabbled lightheartedly in the series there on. Nonetheless, this game can be played from the bottom up for fun or for competition, and it's good that Sakurai recognizes both camps. It might be the SSB that I decide to get serious about competing in again... We'll see. @admwllms Well, except for the Wii and the NES Classic which did much better than they expected. I'll also bet that the N64 , Gamecube and Wii U did worse than expected. @memoryman3 Daisy's an annoying s***, Peach isn't. There you go. I find it so funny how this interview with Trinen is like "no, Smash was designed for competition and serious tournament play and Sakurai went out of his way to carefully design that from the start!" And then the comments the other day from Sakurai are basically "screw competitive players, you're doing it wrong." I forget when I first heard about Smash Bros (N64). Might have been Nintendo Power, or online, but either way I was really excited from the start. To a pre-teen, it seemed like a no brainier to put all your favorite characters in a fighting game. It was THE game during Summer '99. That said, I don't remember that big of a promo blitz for it. Perfect Dark, DK64, even Conker's Bad Fur Day had bigger pushes. Regardless of whether they saw big potential in the first one or not, they definitely saw it in the second given that it got the huge push that a Mario or Zelda game would. Luigi's Mansion and Blue Storm got pushed too, but it was Melee that really sold the Gamecube that Winter. I think a lot of this though depends on how you are defining accident when it comes to games. Obviously nintendo knows how to design games, but then why isn't every game a hit? Are those games that aren't hits just haphazardly thrown together with no real design or purpose? Of course not. That 100% sold me the game. Immediately used my paycheck on it. Glorious summer of 1999. Bill, I love ya, but that is terribly untrue for so many creators. Smash 64 was a side project done on weekends without much indicarion it could be localized. @MeloMan There is an interview with Iwata where he admits that a lot of the competitive moves in Melee are programming gaps. They wanted to make sure Melee launched in time so they (Iwata and Sakurai) ignored them because they thought no one would use them because of how precise you had to be. To them, the games are party games, not competitive fighters. It's why it's my least favorite Smash. Because for all intents and purposes, it's buggy. It's still a fun game. It was no accident that my friends and I all saw the TV commercial and got the game on 64. Part of the appeal of Smash to me is each iteration of the game always takes me back to fun times of buttons clicking, friends shouting, and having a blast beating the snot out of each other till the street lights came on. That article title/subtitle is totally a Rubio Robot reference, and I refuse to be convinced otherwise. I thought it’s a messy game when I first played it on Wii U... and after several months of playing, it’s still a messy game. It's amazing how well it sold on Wii U, even pushing that system to 40 million units after it released, and, oh wait... Yeah, Smash isn't this big system seller like everyone thinks it is, Wii U proves that. Of course an innovative fighting game featuring many of the most popular characters in video games history could only become popular by luck. Give me a break. Sorry, but isn’t that precisely the “happy accident” argument? It’s not that the developers didn’t know how to make a game but it still turned out good. It’s that Smash 64 was a relatively low budget project (nowhere near E ticket scope and scale) but sold over 5 million pieces anyway, thus leading to a bigger scale entry for launch with the next Nintendo console. I've tried to get into Smash but I just can't. The mechanics have never clicked with me. I find it kind of fun to play with a group of friends for maybe an hour tops, but I get bored with it quickly. I can see the appeal as a competitive game, but I know I'd never be anywhere near good enough to play competitively. Bahahaha! No. “This is a great idea for a game! I bet our fans would love this! Lets give it a shot!” Then committees and boards all stroked their goatees and twirled their staches. A hologram of Wario’s greedy grin appeared above their table like sith lord... and some time later... a 64 game was born. Grand Theft Auto 6 could have been a Wii U exclusive, and the Wii U still wouldn't have sold 40 million units. Probably not even 20 million IMO. Smash Bros is a huge franchise that is set to grow even further this December. But it can't and won't single-handedly rescue a fundamentally unappealing and poorly marketed console like the Wii U from poor sales. Thankfully, the Switch isn't a Wii U, so Nintendo doesn't have to worry about Smash Ultimate "rescuing" the Switch. If Smash became popular by accident, how do we know nothing else did? Obviously, there are certain circumstances that can affect how well a game does, but even with the worst titles, just connecting everything to blind luck or fortunate coincidences does little to acknowledge whatever work was put into games that makes them work, or the weaknesses that hold them back. Even the worst of cell phone games have a certain hook to them that has more reasoning for catching on than just dumb luck. If it's just the first to hit on a certain gameplay formula, that goes a long way to setting a foundation for other games to follow, which is a big deal.